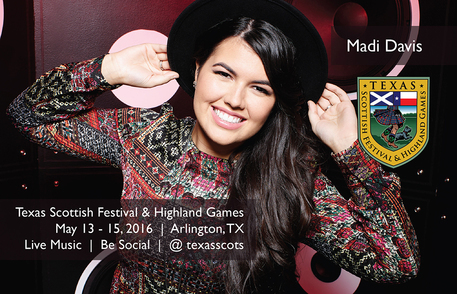 Singer-Songwriter, Madi Davis, from McKinney TX, ended her run on NBC's The Voice as a Top 6 Semi-Finalist! She shared her heart and artistry with the world singing brilliant arrangements of classics; Big Girls Don't Cry, Girls Just Want To Have Fun & A Case of You by Joni Mitchell. Her version of Girls Just Want To Have Fun charted in Billboards Hot 100 and topped the overall iTunes charts at #5. All of her LIVE performance recordings made iTunes overall Top 50. Madi definitely made her mark as an artist on the show, singing what she loves, with poise beyond her years...all 16 of them. Madi has released original music as well as the unique covers that she sang on The Voice. Her latest release "What I Know," contains hints of sorrowful singer songwriter, folk, and even a touch of R&B. This collection of music has something for everyone. All of Madi's music is available online--on CD Baby, iTunes, Google Play and Spotify. More information on Madi and her upcoming June LP release is available on her website www.madiannedavis.com.